Water Alarm - Leak Bug Electronic Leak Detector - Finds Leaks Before Damage: Don't react to water damage. Let the Leak Bug or Puppy save you before its too late. It beeps in as little as 1/32 of water before damage spreads. And, if battery gets low, it will alert you as well. It's the best investment and protection you can get for your home! Water Alarm - The Leak Bug and Puppy finds leaks before costly damage occurs to your home. Water Detector Alert - Highly sensitive sensor beeps loudly when as little of 1/32 inch is detected. Alarm will sound up to a week with direct water contact. 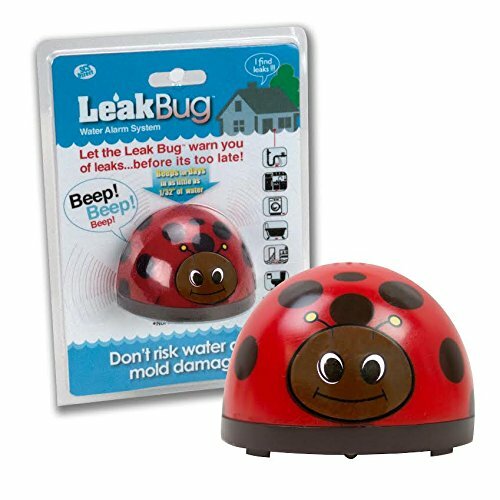 Leak Alert - The Leak Bug beeps when the batteries are low so your home is never at risk. Battery-operated, no wiring required. Flood Detector - Put multiples around the house in bathrooms, laundry rooms, in the kitchen by the dishwasher or under the sink, in the basement or garage by the hot water heater and sump pump, etc. If you have any questions about this product by SCS Direct, contact us by completing and submitting the form below. If you are looking for a specif part number, please include it with your message.